End Result: Be able to talk to Trove using Alexa. First up we’ll details what an Alexa skill is. The skill we’re going to build is going to be an basic enough program that queries Trove for random book. Building your first skill will comprise of four steps. First we’re going to copy the ‘Trove’ code into Amazon Lambda, which will be responsible for running the code. 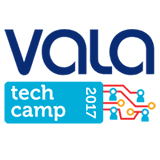 Next we’re going to set up our skill in the Amazon Alexa Skills Developer Portal, and link our lambda account to that skill. Then we’re going to test using the Amazon service simulator and on an Alexa-enabled device. Lastly, we’ll walk through the steps of customizing your skill to your needs. Login or create an account with the same Amazon account that your Alexa device is linked to. 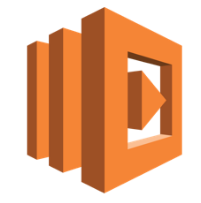 In the AWS Lambda console click Create a Lambda function, then in the Slect blueporint screen - select Python 3.6 from the Runtime dropdown and click the Blank function. In the ‘Configure triggers’ screen click on the dotted grey box and select Alexa Skills Kit. This setups the basic lambda function ready for Alexa. Enter the name and description of your Lambda function. It’s not very important what the name is but it needs to be unique, you can just use “Trove”. In the top right it should say “N. Virginia”. If that’s not the case please select “US-East (N. Virginia)” from the dropdown. In the code section you get the option to either enter the code inline or upload a zip file. As the code we are using requires a few extra Python modules we’ll chouse the zip option. For those wondering what this code we are about to upload actual does, below is the main sample. This is a very simple Alexa skill that queries (based on a random word) the Trove API for a book. Very simple but a great intro to shows what Alexa can do. Back in Lambda, you’re going to scroll down a bit and we are going to enter our Trove API key as an environment variable. This allows the Python script to access the API without us having to store it directly in the file. The next step not to miss that is very important is the Handler section. Enter lambda_function.lambda_handler in this field. This field tells Lambda the file_name and function to run. 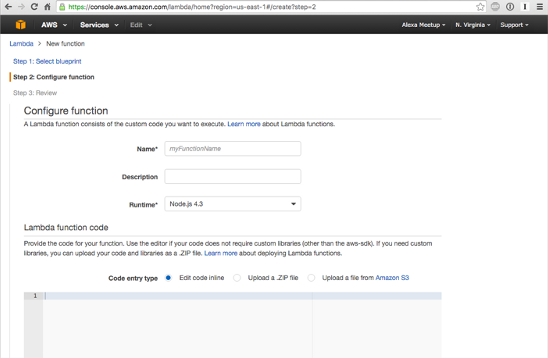 Scroll down a bit further to the “Lambda function handler and role” section. You’re going to want to set the role to “lambda_basic_execution”. It’s important to note that if this is your first time using Lambda, you’ll have to create the “lambda_basic_execution” role. You can do that by selecting the first option “* Basic Execution” and clicking the blue button on the next page. After you take that step, you should be able to select “lambda_basic_execution”. Next expand the ‘Advanced settings’ section and increase the timeout from 3 seconds to 10 (or more). This is if the Trove API is slow to respond the Lambda function wont auto timeout. Please note if you’ve never signed up for the Amazon Developer Portal, you’ll have to do that first before the “Alexa Skills Kit” will appear. Please also make sure you use the same Amazon account as the one you’re using for AWS and your Echo. Keep the Amazon Lambda tab open though, we’ll need to come back to it! 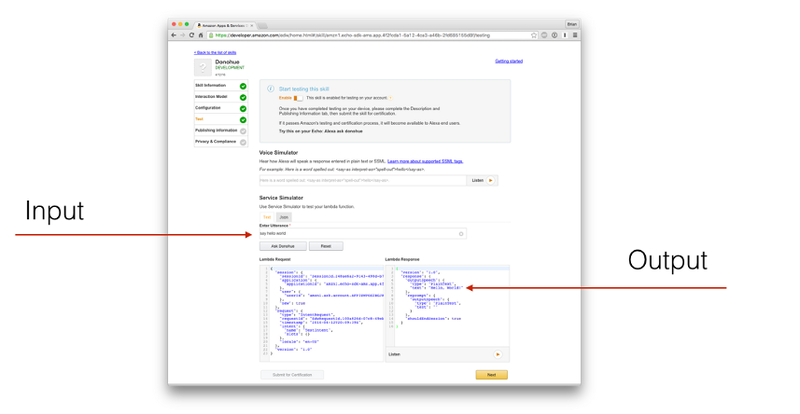 Open the Amazon Developer Alexa Skills portal and login with the same Amazon account that your Alexa device is linked with. Navigate to Add New Skill and click the yellow “Get Started >” button under “Alexa Skills Kit”, then the yellow “Add a New Skill” button on the next page. The name of your Amazon Alexa skill must be unique for your account, and the invocation name is what you’ll use to activate the skill. “Alexa, tell to say Hello, World”. In this example we'll use `Trove` as the name. Click the yellow “Next” button when you’re ready! Here is where we’re going to tell the skill which intents we support, and what type of words will trigger each intent. Get ready for some copy and pasting. Change the radio button from HTTPS to Lambda ARN and select the No radio button under Account Linking. 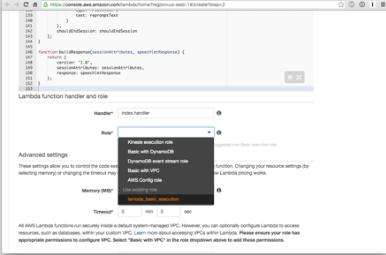 Now we’ll have to go and grab the Lambda Amazon Resource Name (ARN) from our Lambda tab. The ARN is on the top right of the Lambda function page. Paste the ARN into the text field, and press Next. After you click Next on the Configuration tab, you should be on the Test tab. Under the Service Simulator portion you’ll be able to enter a sample utterance to trigger your skill. For the Trove example you should type search random book, and on the right you should see the output from the Lambda function you created: Hello, World! One thing that cause be issues when I first created a skill was that the skill wasn’t immediately available for my own account to actual test. The solution of this is to add your amazon account to the list of beta testers for this skill. In the beta testign section there will be an invitation link for each user. For your own user click on the link and then ‘Enable’ this new skill on your Alexa account. If you got the correct output using the Service Simulator, try it on the Amazon Echo. We were using Trove as the invocation name in this presentation, but you should use the invocation name you set previously. If you don’t have a device you can use the Echosim website to test a virtual Echo. 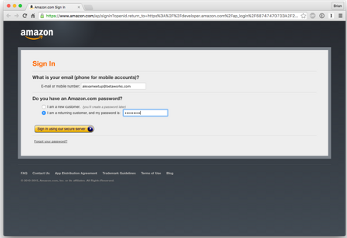 Just login with your Amazon account used earlier and follow the prompts.